For one week every month, our staff goes casual for a cause! 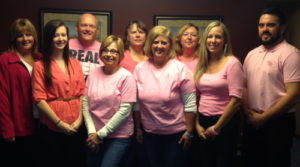 By donating to our office breast cancer fund, employees earn the right to wear jeans into the office. Since October is Breast Cancer Awareness Month, we decided to step it up by wearing pink to raise awareness and setting a fundraising goal of $500.